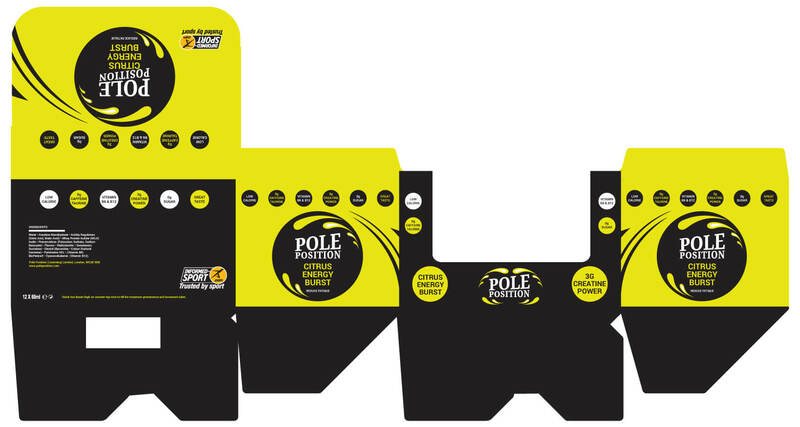 Pole Position is a creatine energy shot aimed at the health and fitness market. From the very first discussion with Pole Position it was clear they were looking for something a little different. Having developed an entirely new way of delivering creatine to the body in liquid form their aim was to create a brand that would reflect this USP and leap off the shelf in a crowded marketplace. The shot bottle and carton are currently in production for launch next year while the project itself is ongoing. After much experimentation we settled on a bold combination of yellow and black for a fresh, eye-catching feel. Further colours will be introduced to the brand as more flavours come to market. The point of sale carton is a key ingredient in attracting a casual consumer purchase. The aim here was to further extend the brand and create a mouth-watering focal point.